Opening doors for students in Kenya with the power of education. Many children of the Mathare slums of Kenya lack food, education, and spiritual guidance. Care and education enables children to combat the effects of extreme poverty. We depend on partners so we that we can transform children’s lives. Help us feed Lion of Judah School! Last year, Reverend Johnson Wambua launched Lion of Judah School in the Kenyan countryside. The school is currently educating forty-one students who come from impoverished subsistence farming and nomadic backgrounds. A significant obstacle to Lion of Judah School’s launch has been a lack of food to nourish the students. 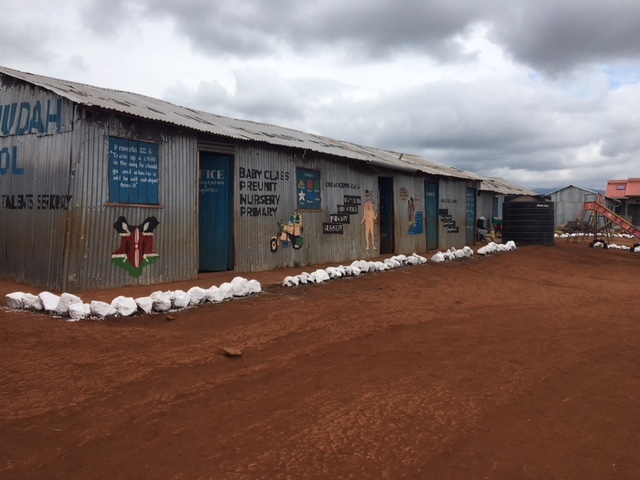 The $500-per-month expense is slowing the process of constructing new classrooms and other facilities that will allow the school to impact more children in rural Kenya. To assist Reverend Wambua with this project, we have launched a CrowdRise (powered by GoFundMe) campaign. Our goal is to raise $6,000 to purchase a year’s supply of food for the students at Lion of Judah. If we succeed, we will accelerate Reverend Wambua’s ambitious long-term vision for the school. Use this link to contribute and share the campaign on social media! We exist to care for impoverished children in Kenya by providing for their educational, physical, and spiritual needs. We are able to care for the 680 students of AIC Zion School in Mathare with quality Christian education, medical care, and two meals per day. Watch this video to learn more about AIC Zion School’s impact in Mathare! Ask us a question or enter your email address to receive our quarterly email newsletter.